The purpose of this article is to see how to integrate Spring Security on top of Openxava standalone application. Openxava build portlets as well as standalone applications. 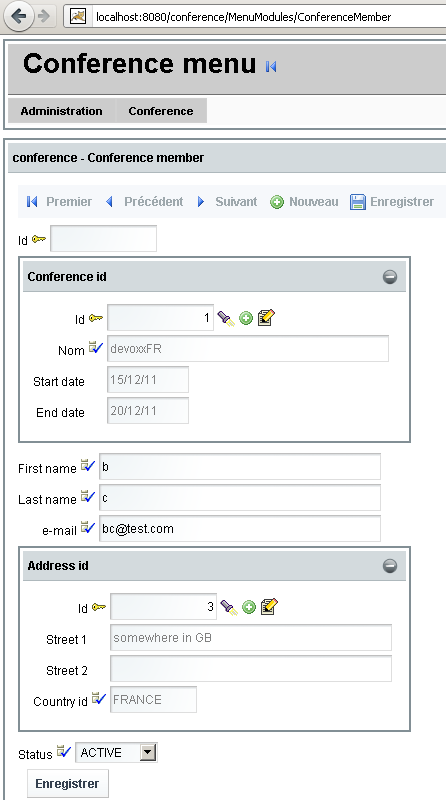 When working with portlets, those are deployed on a portal such as Liferay which handles secured access by configuration. Meanwhile while working as standalone application you have to handle this functionality yourself. This page will illustrate how to add spring security (authentication/authorisation) functionalities. The focus will be put the authorisations aspects since authorisation is often enterprise-environment specific. To demonstrate the integration, this article will use the minuteproject Lazuly showcase application generated for Openxava. The first part identifies and explains the actions to undertake. The second part explains what minuteproject can do to fasten your development by generated a customed spring-security integration for you Openxava application. Eventually a set of tests will ensure that the resulting application is correctly protected for URL direct access as well as content display. Furthermore, the integration is technologically non-intruisive. You do not have to change Openxava code for it to work. given like that it is hard to protect. The module and application are passed as parameters. And the 'parameter' access are banned. 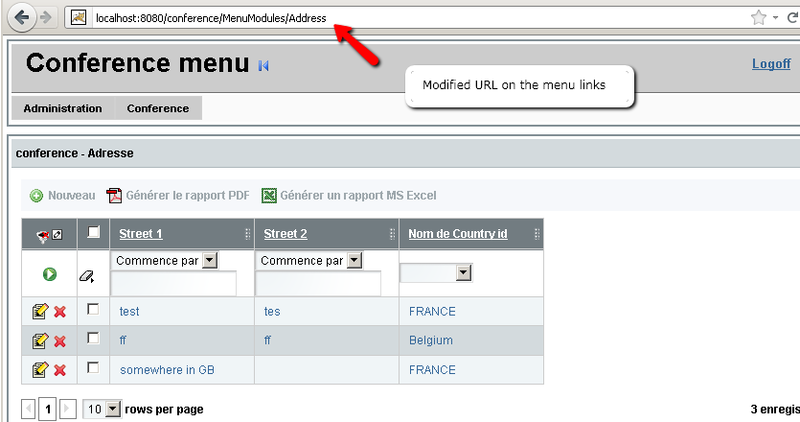 homeMenu.jsp is a page including a header with menu (to protect and whose menu link URL are correspond to the secured format) and a footer. 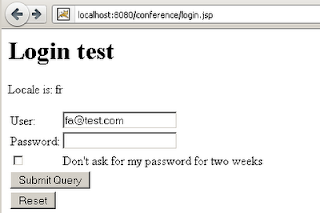 Servlet configuration snippet done in Openxava servlets.xml. This snippet will be package in war web.xml at build time by OpenXava ant script. To do that add an spring applicationContext-security.xml in you classpath (ex: Openxava src folder). This means that all path after xava will be accessible (ex: css...) safe jsp expect one homeMenu.jsp is available to all registered user (ie having role ROLE_APPLICATION_USER cf attribution at authorisation part further). 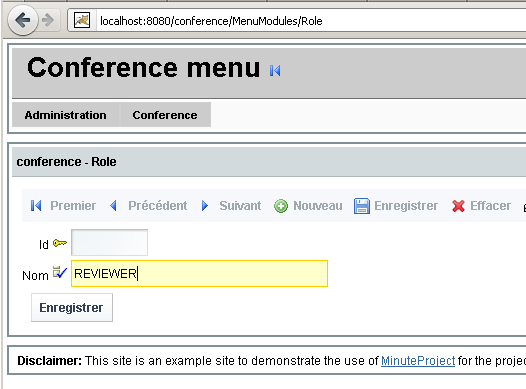 Of course ensure that the role ROLE_NOT_PRESENT is really not present in your app. The idea is to give CRUD access on a entity base on role. To be more explicit, I define 3 roles with their scope. Reviewer can access to the statistic views but not the administration. 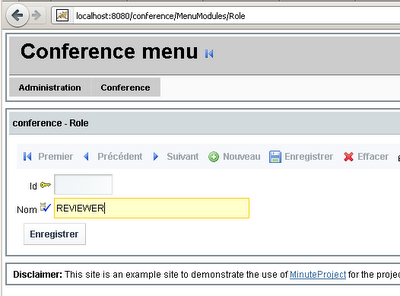 Both reviewer and Administrator can do what Application_user can do. As said before 'the CRUD access on a entity is role based' but the affectation mechanism has to reflect that. OpenXava has annotation to create an entity from another one. It is then logical that we cannot create entity B from entity A, if we do not have CRUD rights on entity B. The mechanism will consist in this case of affectation only with search functionalities. 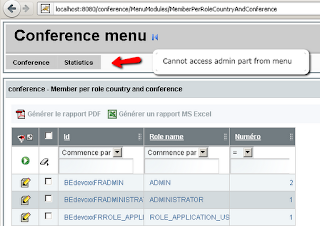 In our scenario it means that a user with 'application_user' only can select a country but can not create any (no create or update icons available). 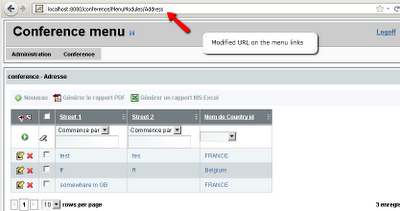 It is also true at the menu level, a user is entitled to see only its menu items corresponding to its profile. Here the menu is done in jsp. For the user to operate, he must be authenticated and authorised (moment where his role profile is loaded granting him with business access rights). I use an simple authentication and authorisation based a DB information. In applicationContext-security.xml add the following snippet. users-by-username-query="SELECT username,password,active FROM user_authentication WHERE username = ?" 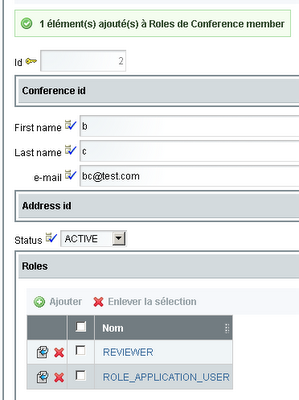 authorities-by-username-query="SELECT username,role FROM user_authorisation WHERE username = ?" Both authorisation and authentication queries have to be valid. Here, they are done on top of views, which means that you have to implement 2 views: user_authentication and user_authorisation. form-error-page to ask for a login again. Doing the integration can be time consuming. As you can notice there is some effort to have the code compliant for a webapp here Openxava to be bodyguard by Spring-Security. Meanwhile when dealing with data centric application, this knowledge can be crystalized to be instantly available. Because...there is an underlying concept that guides our choice and lead to best pratices. It is one thing to execute them, it is another to state it. The question is how do we specify which entity to access and to which role. The idea is to express with simplicity the relationship between role or permission and action. The full CRUD is associated to a specific role. The affection (linkage of an entity from another by search) is when to entities are linked but not all the role of the main entities are the same as the roles of the target. Otherwise affection goes with creation and update. If you represent an entity-relationship diagram, you should see boxes and links. Boxes for entities and links for relationships. Give each role/permission a color. Paint all the boxes that are full CRUD with the corresponding role color... Yes, you may paint the same box twice (resulting is color combination). The result gives you the Color access spectrum of your DB. But the underlying idea is evident. What Minuteproject allows you to do it by enriching your model with this color spectrum at the entity level or at the package level. This enables you to work with concept only closed to UC agnostic of technology implementations. The track springsecurity holding the configuration is not yet bundled in minuteproject release 0.8 but will be present for 0.8.1+. Here a very dummy implementation. As you can not there is a little redundancy in the user_authentication view, since sometimes the role administrator is refered sometimes role_administrator. This will be homogenized in next release. So when user fa@test.com connects he will get the role Administrator which allows him to access the administrator menu and create a new role called 'REVIEWER'. He can also create a new conference member and associate with the role 'REVIEWER'. Download the lazuly-openxava-springsecurity minuteproject configuration from google code minuteproject. 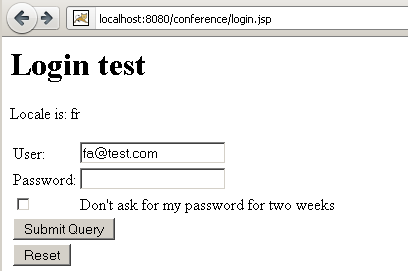 from /DEV/output/openxava-springsecurity/conference run build-conference(.cmd/sh). This will trigger the build that is successful but not the deployment due to information before. Default URL at context root of the application. 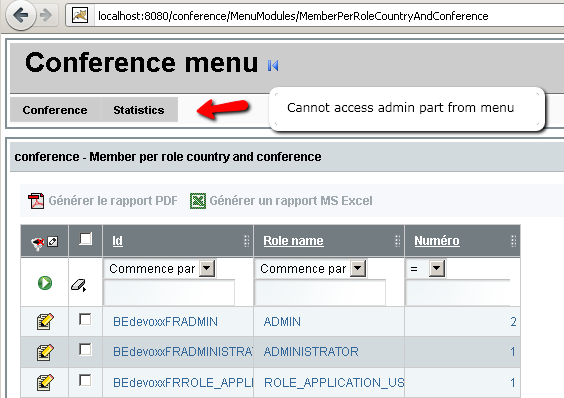 The user have access to the admin and conference part not the statistics. Now the application is secured. This article showed the configuration and manipulation to integrate spring security with openxava in a non-intrusive manner. It stressed a new concept 'DB color access spectrum' and how to densify the security information in minuteproject configuration. It is simple to express and analyst friendly. It is not bound to a technology. It is a step in easily defining fine grain access, its combination with profile based access and state based access (to do manually... for the moment ;)) could pave the way to intuitive and implicit workflows instead of heavy BPM solutions. Using colors to add a new sematic dimension to the model is a very good idea, perhaps we need a good graphical tool to support it. It remembers me the "Java Modeling in Color with UML" book from Peter Coad. On the other hand, the article is a very useful one, because covers a hole in the OpenXava documentation. 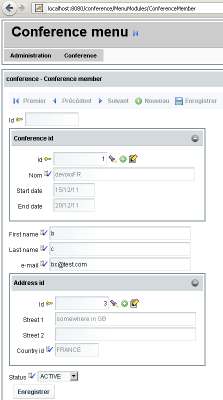 The hole about how to configure the security by yourself. Yes, I agree it shares the same principle for security aspects. Being able to work at entity level or at package level (group of entity sharing same business concern) is one important aspect. In fact, ideally the enrichment should be done graphically (far more intuitive than xml config). Why not an eclipse plug-in?